First marketed as a high performance solution for kitchen and bathroom worktops, DuPont™ Corian® (www.corian.com) is now a leading global brand in superior quality surfacing materials for design, architecture and furnishing, a solution chosen worldwide by many dozens of thousands of architects, designers and companies and by millions of consumers. 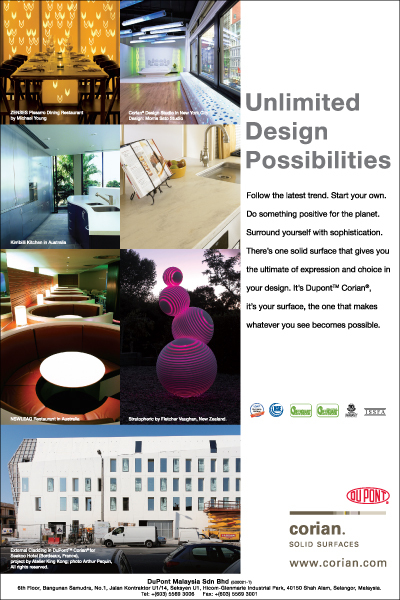 Corian® has superior thermoform ability and translucency, enable innovative design. Corian® can also be integrated with cutting-edge technology to holistically bring designs to life, from sculpture to furniture to wall cladding.